My art update gave you a little sneak into our current home reno project....and here's the rest. We (aka Michael) is actually painting our kitchen cabinets. 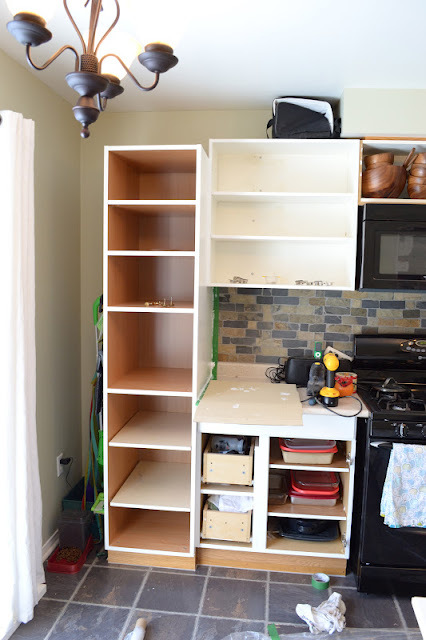 We don't have the budget to actually reno the kitchen, which we would LOVE to do since it has a lot of wasted space and wasn't done all that well, but perhaps we'll get to that at a later date. As for now we're doing what we can, which is to paint! It's a slow process as it is winter and our work space is limited to the kitchen, which is why it looks crazy! 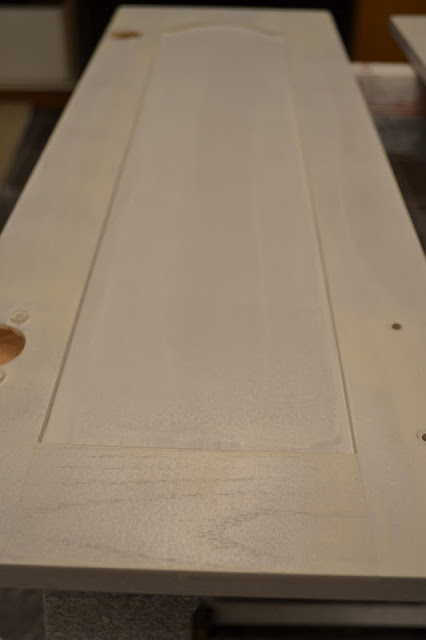 Michael has been slowly moving around the cabinets, sanding the doors in the garage, then bringing them in and wiping them down with TSP, then applying 2 coats on the backside and 3 on the front. I will be in charge of painting the weird space to the left since Michael can't fit back there..haha! I will also be doing the narrow space above the cabinets just under the bulk head as well as the kick plates. I decided it wasn't worth the effort to paint the inside of the cabinets, so you can see the natural oak still on the tall cabinet. This whole section of cabinet left of the stove is so makeshift and we are quite sure they are bathroom cabinets that have been randomly put together which is why the one on top is white on the inside. More progress. We still don't have the cabinets above the microwave cut down! Wow, slackers. Check that post out here. We are using SICO's furniture and cabinets paint with a Melamine finish in the off-the-counter Natural White. Here are the handles that I FINALLY decided on after 6 stops to 3 different stores and exchanging 2 other options (note: take the old handles with you to get the right size...duh!). I still only ended up with 9 of them, so had to order the remaining 15, which wont be in until next Friday. Good thing we don't need them all at once. Here is one door with 1 coat. You can see it yellows a bit, which is why 2 and 3 coats is necessary.